A few weeks ago in Washington, DC I met with Marusya Chavchavadze and Lena Kiladze with the American Friends of Georgia. Inc., a well known philanthropic organization providing assistance to families and children of Georgia since 1994. Our meeting was arranged by a mutual American friend who lived in Georgia for a number of years. I readily agreed to meet Lena and Marusya to learn more about their organization and to share with them my love of Georgia and why I established the American Georgian Travel Group. For some reason the name Chavchavadze seemed familiar to me and after the meeting, it dawned on me that in 2012, I visited the home of Alexander Chavchavadze in Kakheti, Georgia. Marusya is the great, great, great, great granddaughter of Alexander Chavchavadze and lives in Massachusetts. What a surprise to meet a direct descendent of a Georgian noble family! We Americans are usually fascinated by royalty and nobility and I’m no exception. I couldn’t wait to research Marusya’s lineage and what I discovered was fascinating! To know that I walked on the same grounds as her ancestors was even more exciting. Regarded as the “father of Georgian romanticism”, Prince Chavchavadze was a decorated Colonel, well educated, wealthy, and a 19th century aristocrat fluent in several Asiatic and European languages. His influence over Georgian literature was beyond measure; his poems especially reminisced about Georgia’s glorious past. Prince Chavchavadze was one of the most influential figures of 19th Century Georgia. I became aware of Prince Chavchavadze’s influence through my travels in Kakheti, the wine country in eastern Georgia. 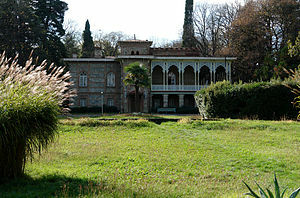 The Prince built a summer mansion in Tsinandali, Kakheti where foreign guests were frequently entertained and served fine vintages made at his estate winery. He built Georgia’s oldest and largest winery where he combined European and centuries-long Georgian wine-making traditions. The highly regarded dry white Tsinandali is still produced there. Sipping the fine wines and walking the Chavchavadze estate was an unforgettable experience. Meeting a descendent of the Prince was even more memorable.